Brandon Radtke, son of Steve and Chris Radtke, was presented the Eagle Scout Award, scouting’s highest honor, at a Court of Honor by Boy Scout Troop 33 in DeKalb. Radtke began his scouting career as a Cub Scout with Pack 134 in Cortland where he earned the Arrow of Light Award. He joined Boy Scout Troop 33 in the spring of 2012 and has enjoyed years of active participation in day trips, service projects, weekend overnights, disaster relief, fundraisers and high adventure. Radtke’s winter adventures included several Klondike Derbies plus the Spearhead program at Tomahawk Scout Reservation in Wisconsin, which included cross-country skiing and learning to build quinzee snow shelters. At Lac Vieux Desert in Wisconsin, he caught northern pike during ice fishing trips. Radtke enjoyed a variety of warm-weather adventures such as backpacking and canoeing plus several years of summer camp at Camp Lowden near Oregon, Illinois. His greatest adventure was a 61-mile high adventure canoe trip across the Atchafalaya Swamp in Louisiana. 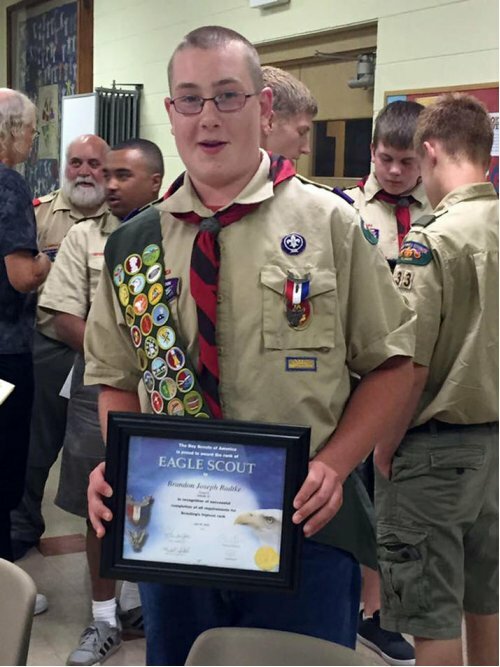 He holds membership in the Order of the Arrow, scouting’s National Honor Society, and has earned 33 merit badges. Leadership responsibilities included serving as troop librarian and working several years as a den chief for Cub Pack 134 in Cortland, his way of giving back to a program he participated in earlier as a Cub Scout. He was involved in local community service projects, especially the Salvation Army food pantry and the Glidden Homestead. Radtke’s Eagle Project involved constructing a mobile library for a literacy program at Barb City Food Pantry in DeKalb. He collected hundreds of books for the food pantry as well as the DeKalb County Courthouse literacy program. Radtke is a sophomore at DeKalb High School.